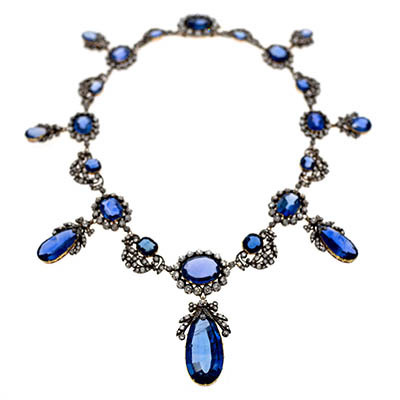 Today, Lang Antiques boasts an expansive and impressive collection of vintage, antique and estate jewelry online. 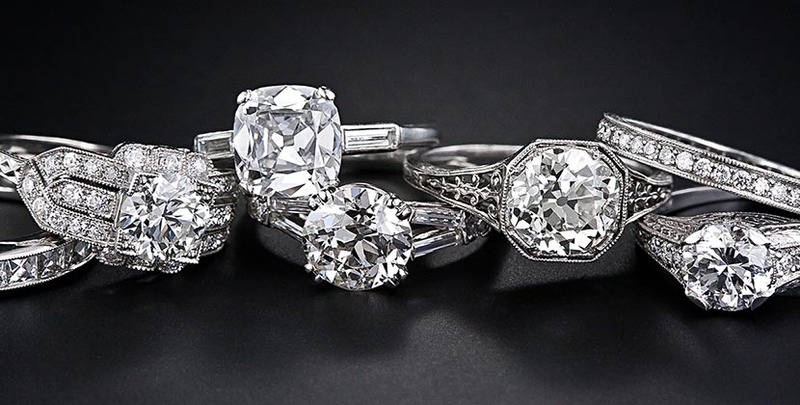 When it comes to engagement rings, the variety and quantity is second to none. 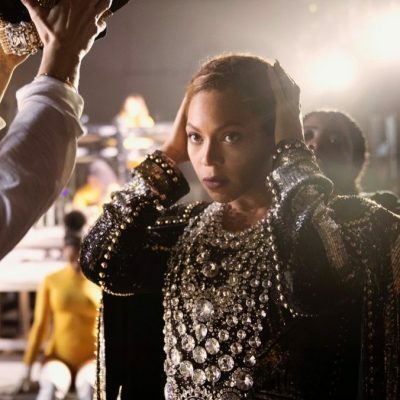 There are over 600 rings on the website in prices ranging from around $700 to $140,000. Suzanne told me all about the engagement rings and the curation process each piece goes through before it become a part of the collection. 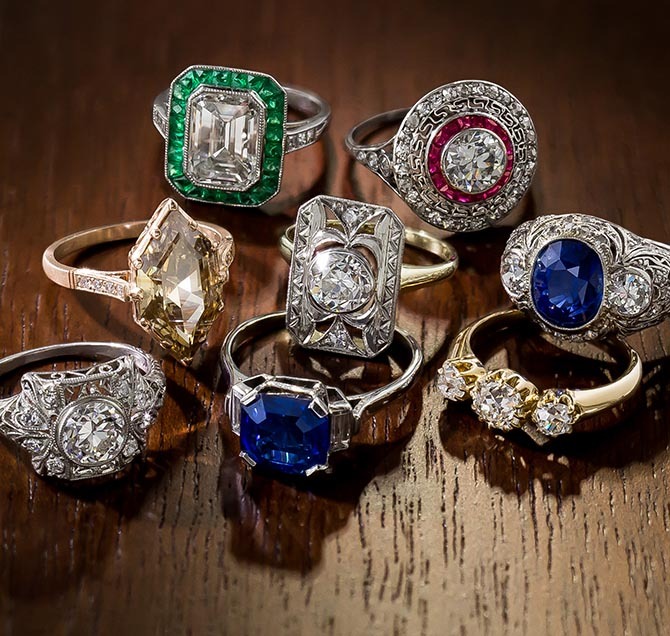 You have a mind-blowing number of vintage, antique and estate rings at Lang Antiques in a huge range of prices. Tell me about the wide variety? 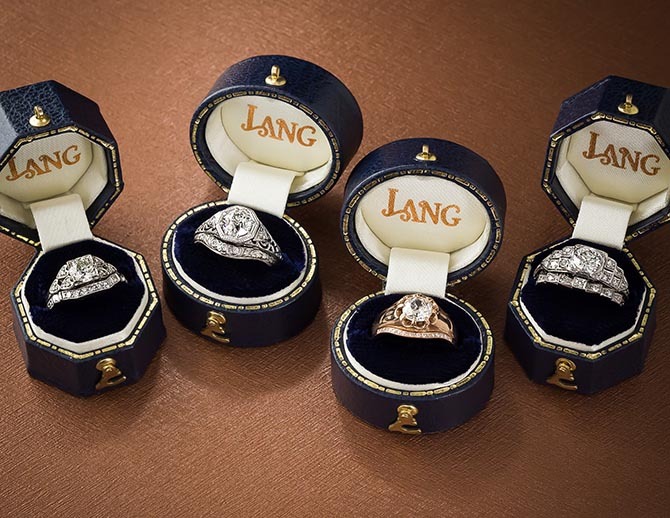 At Lang’s we are pretty democratic and believe in having jewelry for couples with various budgets. A piece of jewelry that isn’t high value can still have great quality in the craftsmanship and design. We add jewelry to the website every day. Each piece we put in the collection is carefully reviewed in our quality control system. My partner Mark Zimmelman or I review every single ring. 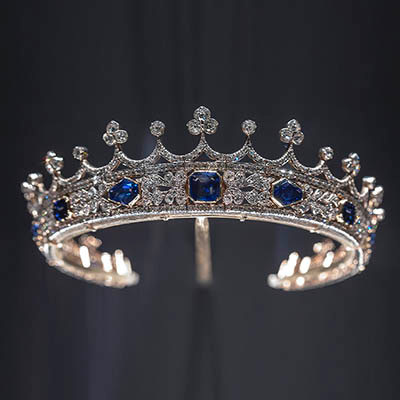 We also have a restoration department that studies the pieces under microscopes to analyze the level of wear of a jewel’s metalwork and stones. We will do light restoration on a ring if it is needed like re-tip the platinum prongs or refresh the little balls of milgrain details. We don’t buy rings that require too much restoration. The pictures on the website show a jewel at 10x magnification. This is the level a jeweler reviews a piece with a loupe. We want clients to be able to see online exactly what we look at when we study the pieces. It seems like the vast majority of the designs on the website are from the Edwardian or Art Deco eras. Tell me about these design periods. The Edwardian era went from 1901 to 1910 and it was the last period of style defined by a British monarch, King Edward VII. In terms of rings, they are made of platinum and have romantic court style details like bows, ribbons, garlands and lacey-style elements. There can be some pieces that are more minimal but the platinum work is generally very elegant. The Art Deco period begins around 1925 and it is more architectural. For the rings, diamonds come in a variety of geometric shapes and there is a clean and modern look overall to the designs. Almost all of the rings with over a 1-carat diamond in the collection have GIA Grading Reports for the center stones. 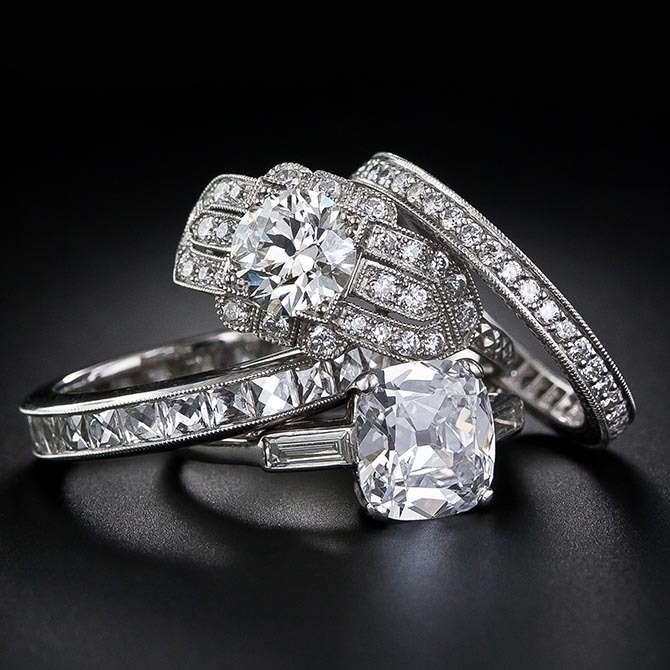 Why is that so important and what can people expect from older diamonds in vintage rings? 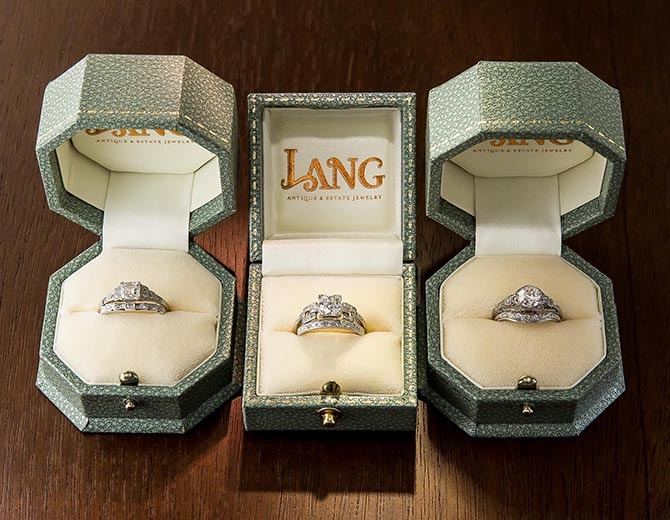 Several of us at Lang Antiques are gemologists and we check the stones carefully, but the GIA Grading Report gives our clients an added level of confidence that an independent expert has also reviewed the gem. Sometimes the design of an engagement ring would be ruined if we removed the center stone to get it graded. On those pieces, we give the client our best guess about the grade of the gem. 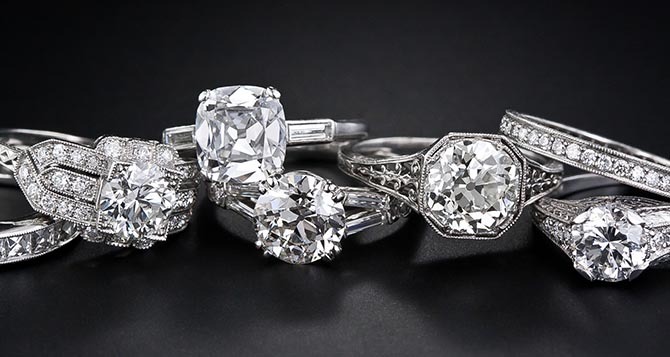 Old-European Cut diamonds are often at the center of vintage rings. They reflect light differently than modern gems and in my opinion are more beautiful. There is a softness to the way they sparkle. Old diamonds were cut by hand so they also have a lot of character. All the rings in the collection have lyrical descriptions online that clearly show a passion for jewelry. Who is writing these? My partner Mark Zimmelman writes most of them. He is a third-generation gem and jewelry dealer and also has a real flair for writing. His description on our About page kind of says it, he is always in search of a synonym for sparkly. What is your best piece of advice you can give someone who doesn’t quite know the style of ring they want or how to find it? The best thing is to look at rings. In our store and online, jewels are arranged by price so people can review things and find the styles that are in within their budget. We pride ourselves on customer service and I have two sales associates that are exclusively devoted to handling the online business. People can call or email to ask us any questions they may have about a jewel. We also frequently email additional photos of a jewel so people can get different perspectives on a design. Where do you ship and what is your return policy on engagement rings? Most of our clients are in the United States, but we do ship to several international locations as well. Any piece can be returned for any reason within 10 days of purchase. Finally, why do you think it is a good idea for couples to choose a vintage engagement ring? Vintage rings, of course, are beautiful and have a sense of history, but they are also recycled and sustainable. They give clients peace of mind about their purchases. It is truly the environmentally responsible choice to wear a vintage piece of jewelry. Honestly, it is the reason I chose to work in this area of jewelry when I began my career decades ago. 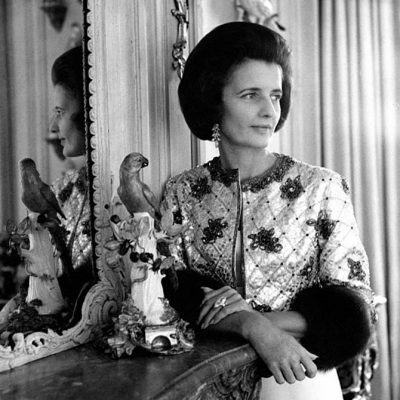 *This post was created in partnership with Lang Antiques.